I spent about 25 years living in Bristol. I went to university there, and after spending a couple of years after graduation working in London – at Waterstones on Charing Cross Road, where my bookselling career began! – I went back to Bristol in 1990 to work in bookshops and libraries, staying there until I moved back to Kenilworth, where I grew up, in 2009. I am not a city girl; I loved Bristol, it’s an amazing city, but in the end I knew I wanted to come back to Warwickshire, back to a small town, and the lure of Abbey Fields and the Castle proved too much. I miss Bristol, especially its bohemian, creative side, but I love rural Warwickshire and living in a place where everything I need is right outside my door. The reason I’m telling you about Bristol is because while I was living there, they launched the Great Reading Adventure, as part of their bid to be European Capital of Culture, and it was great. The idea was to get everyone reading the same book: in that first year, we read Treasure Island. I would love Kenilworth to do something like this, and a while back I tried to launch a similar scheme here. One of the things I struggle with is keeping a lot of plates spinning at the same time, and after an enthusiastic initial response, I failed to follow it up properly, and time has gone on. But summer seems a good time to boost the initiative. The book I have chosen is My Name Is Leon by Kit de Waal. I chose it for a number of reasons. Kit is local – she grew up in Birmingham and now lives in Leamington (and some of you may have heard her speak at Kenilworth Arts Festival last year – she will be back at this year’s Festival too). It’s a book that can be read by teenagers as well as adults, giving a wide scope. And it’s a book with a lot to think about and discuss. It’s also a wonderful story, written with warmth and humanity. It has an easy, readable style, but it makes you think and it makes you feel. Leon is an 8 year old boy at the start of the book. His mother has just given birth to his baby brother; the baby has a different father from Leon. Their mother is white, the baby’s father is white, Leon’s father is black, both fathers are absent. Leon loves his baby brother; he loves his mother too. But she struggles to cope, and the book is the story of what happens to Leon when crisis point is reached. You will love Leon; his story will both break your heart and warm it. It’s several months since I finished reading it, and I still think about him often. So: why not join in our Kenilworth Reads adventure? You can buy the book from Kenilworth Books, or borrow it from the library. I will soon have a sheet that you can pick up at the bookshop or that I can email to you with questions and discussion points. I will create an online forum, and there is a Facebook group already for those on Facebook. If you’re in a book club, why not read it as a group? And we will have some face to face meetings at the bookshop. I have plans for a Christmas read too, a book that will also appeal to a wide age range, and I will also include a book for younger children at Christmas. I will post more soon, and let you know when the discussion sheet is ready and an online discussion space sorted. There will be a page on this website dedicated to it as well – you will be able to post comments there, maybe even just let us know you are joining in. It would be great to get this off the ground and make it an annual event. I hope lots of Kenilworth people will join us! 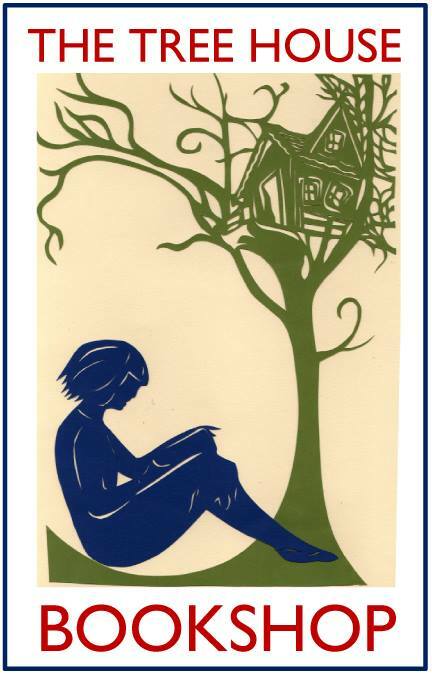 The Tree House Bookshop is five years old! We opened on 26 July 2013. It’s true that we had a hiatus – we had to move out of our premises at Christmas 2014, and moved to our current premises in April 2015, and there was also a month when Astley Book Farm took over; but in all that time, the company has remained in my name and we never got as far as transferring the lease to Astley. And we did stay open! Somehow we have survived. Huge thanks to all those who supported our crowdfunders, to our patron Warren Ellis who remains a daily inspiration and motivation, and to a great team of volunteers and supporters – plus our constantly growing army of customers. Amazing. I am still not earning anything from it, but both I and the bookshop somehow manage to keep going! I am taking this opportunity to think a bit about what the Tree House is, why we’re here, why we’re *still* here, and some of the issues at the heart of what we do. There’s a kind of awkwardness to it, as we don’t really fit into the kind of categories we often seem to belong to. We are a bookshop – but not in the sense that those selling new books are. We don’t deal with publishers, we are not part of the Booksellers Association, we are not really a retail business in the same way because the finances work differently and the relationship we have with the rest of the book industry is a bit different. We are not even a second-hand bookshop in the true sense of the word – we don’t buy books, we don’t have much in the way of antiquarian books (we do get some, but not much, because of our policy of only taking donations). We are a limited company, but operating as a non-profit (not that we make any profit!). There has been much talk recently of the way the world of publishing works, and how little authors get paid. There is an excellent article entitled ‘Publish or Be Damned’ on the Kenilworth Books website to which I would refer you for an in-depth study of that. I am aware that the whole issue of selling second-hand books is problematic in some ways. We are not supporting authors financially, and may be seen as making life harder for them by offering cheap second-hand copies of books in competition with new books, whose sales do provide royalties (inadequate but essential to the livelihood of authors). This is undeniable. But is there a place for second-hand books? There certainly is, despite some of the complications. One major asset is that books that are out of print or not easily available any more remain in circulation. Most of the books we have are older books – certainly many contemporary ones, but we don’t get the current titles until people have read them and passed them on. There is also the issue of what people can afford: not everyone can afford to buy as many new books as they would like to read. I would add here that libraries, which are under threat, are the biggest asset here, as authors do get a very small amount each time you borrow a book – so if you can’t afford new books, use your library – and if you don’t have one, campaign to get one! Libraries are invaluable resources on so many levels. But I digress… Another factor for us is that people appreciate having somewhere to take books they no longer want. There is a limit to how many books charity shops can take, simply due to storage issues, and so people bring them to us. We support charities and local campaigns where we can, and the non-profit promise means that we do give any surplus to charity, so people feel the whole venture is worth supporting. We have also built up a strong core of regulars who are a community. Friendships have been made, even couple got together through the bookshop and are still going strong four years on. Books are a means to that end as well as an end in themselves. The books we sell would end up in the recycling bins at the tip – but it’s much better to recycle them as books, to offer people affordable reading material, a nice place to browse, even to sit and read, the opportunity to take a chance on a new author. They might not pay £8 to take a risk, but they will pay £2. This is dangerously close to the ‘exposure’ argument – that writers and musicians should perform without pay because it’s good ‘exposure’, an iniquitous practice; but it’s not that, and while the author gets no royalties, I hope there might be a knock-on effect. I urge everyone who can afford it to buy new books, at full price, from independent booksellers. This makes for the healthiest possible book industry. If you can’t afford new books, borrow them from the library. If you don’t have a library, or if you want to own the book, buy second-hand. That would be my pecking order. It seems as though I am shooting myself in the foot, but that’s because I am not about the business model, I am not here because I want to be a businesswoman, and the only reason I run a business is because I have to pay rent and rates, and selling books enables me to do that. Otherwise I would have a completely different sort of environment. If I were to win the lottery, that’s what I would do – something that doesn’t involve commerce. The books and the people who want to read them and who want to meet other people who like books – those are the things that matter. My life would be transformed if it weren’t for the financial side of things – I am sure that’s true for many or even all of us! I don’t enjoy the business side of things one tiny bit. But I am proud of my little bookshop, on all sorts of levels, and the good thing about charging for books is that at least they retain some sort of value; one of the big problems in the arts is that we don’t value them enough, we expect free live music in bars, we prefer to buy discounted books than support authors and independent bookshops and small publishers, we think they are some sort of extra, when in fact the arts are intrinsic to the health and richness of any society. We cannot live without them. I for one do not want to live without them. And in a tiny way, I am trying to promote this very big idea. So I make no apology for selling second-hand books, neither to authors nor to customers. I think it’s a good thing. I think second-hand bookshops are vital, for keeping books in circulation especially when they go out of print, for the serendipity they provide in browsing shelves of unexpected things, for promoting the idea that books are valuable objects and for doing all this on the high street, as part of sustaining healthy communities. As we celebrate five years of being in business, and despite being financially worse off in my 50s than I have ever been before, I am as committed to all of this as I ever was, and with so much of myself now invested in it, I hope to be in business another five years from now. Click on the image for the link to our crowdfunder campaign! Today we’ve launched a very ambitious campaign – trying to raise £5000 for the bookshop in just six weeks… So many have given generously in the past, and I don’t want to ask the same people to keep giving, but we now have a lot of followers on Twitter and Facebook, and if everyone shares, and maybe their friends and followers share, we could have a huge reach and the potential for lots of support! The best way to support us is to keep spreading the word (as well as buying books, of course! ), so if anyone out there is prepared to share, retweet, etc, that would be marvellous. We are hoping for an injection of cash to boost our ongoing efforts to raise our game a little and make our regular income stronger. The crowdfunding is to help enable us to survive, and to provide funds for things such as producing some good publicity material (flyers, bookmarks, postcards and more) and a window graphic to make it clearer who and what we are, renewing our PRS and Film licences so that we can carry on playing music and showing films, improving the lighting (those who have visited know it’s a bit basic and there are several bulbs/lights that need replacing! ), sorting out our hot water boiler to help with washing up, so that we can perhaps do more in terms of offering refreshments, and other things besides. If we raise enough, I want to go beyond these necessities and make the bookshop itself – the physical space – a lovelier, more magical place than it already is. So please do have a look at the campaign, and please click here and share the link as much as you can. The link will stay at the top right of our homepage here, linked through the image of the bookshop, and you can share on various social media sites directly from the crowdfunding page. We get to keep whatever pledges we raise in the next six weeks, but if we can reach our £5000 target, that would be amazing! We have raised £90 in the first hour, so let’s see how far we can get… Thank you in advance! Every single share or retweet helps. In the meantime, watch our Tree House Sessions video for inspiration! We have launched two new ways that you can be more involved in and support the Tree House, whether you are a regular visitor or live far away – both work on a monthly standing order system. For locals, a voucher scheme, and for those further away, a surprise book club. Here is how they work. If you want to join the local membership scheme, for people who visit the bookshop in person, you can set up a standing order for £5 or £10 a month, and we will post you a voucher each month for your chosen amount. These are not dated and can therefore be used at any time. They are redeemable against books, tea and films – not, I’m afraid, against our music gigs, which we need to fund independently. Bring your voucher to the bookshop to spend; if you don’t spend it all, we will mark it with the remaining balance to keep for another time. Treat the bookshop as your club! Come and sit, drink tea, read…we sometimes have newspapers, when the lovely Jane donates her copy obtained free with her shopping from Waitrose. If you are not a regular visitor and live in the UK – or live locally but enjoy receiving books in the post! – you can join our mail order book club. You tell us what sort of books you like and we choose books from our stock to send to you – so it’s always a bit of a mystery as to what you will get! You can give us feedback on what we send to help us refine our selections, and you can let us know favourite authors or series of books – we can’t guarantee any particular titles, but can keep an eye open for something if you desperately want it. However, part of the fun is getting surprises in the post each month. £5 a month gives you two books, £10 a month gives you four books – postage is included. Go to our Membership page for the relevant information on how to join either of these schemes. Joining will help the Tree House in terms of regular income, will enhance our sense of community spirit by making the place feel more like a club, and hopefully will be fun for those of you who join. …still in boxes, but they are in! And we have some bookcases – need more, but a good start. Here is a slideshow of the current state of affairs in the new premises. Huge, huge thanks to Paul Seward at E-Warehousing who has very kindly stored our books and some other bits and pieces and heroically delivered them to the new shop yesterday, along with some bookcases and some other excellent furniture. And also huge thanks to Lewis, Charlotte, Tom, Vicki, Naomi and Andrew who have done fantastic work unloading, cleaning and helping in all sorts of ways. We should be able to reopen quite soon, even before we have all the bookcases we need – as soon as books are on shelves we can start selling them! And showing films and offering cups of tea… We are also already planning a Mindfulness taster session and eight-week course and there will be an evening of entertainment on Friday 1 May to relaunch the Tree House officially – more news on all these things in due course. The focus will be very much on books. We have a bit less space than in the other shop, so will be a little more restricted – and therefore selective – in what books we can put on display, and we have learned from the last shop what does and doesn’t sell well in Kenilworth. But we will generally make the focus on books even clearer than before – we would like more literary events, and the Film Club, the Mindfulness courses, lectures (on art, literature and history) and the live music will be the core of our evening offerings. We won’t be running craft workshops (though we will still have our Wednesday evening social group for needlecrafters) nor using the bookshop for other groups or sessions, and we won’t have wifi – we want to encourage books rather than the internet! What we will have is a warm, inviting place, centred around books and the arts and with a concern for the environment. The generosity of all those who have contributed to our crowdfunding and the enthusiasm of the many who have called in or waved through the window over the last few days shows that the momentum within the community has not been lost and we look forward to continuing to offer a place where community can grow. Happy Easter to everyone – as one of our regulars said, it seems appropriate that the Tree House is being resurrected at this time of year!